Hi everyone! 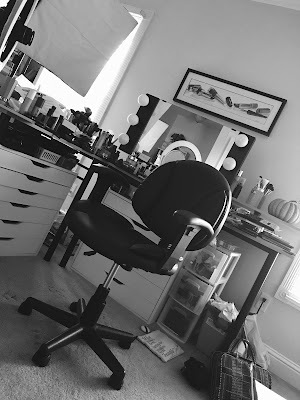 I just spent about 10 minutes standing around in my makeup room trying to figure out what to blog about for my daily post! Seems about right... after all, we're on day 23 of Non-Stop November! I decided it might be fun to pick out 5 products that I tend to use every single day, no matter what. I have a large makeup collection with a lot of products to choose from... I'll switch out foundations, concealers, eye makeup, cheek colors, and lip colors almost daily. But I realized, there are some products that I continue to use every day, regardless of the other products I change. I'd wear these products if it were a random day at work, a day shopping, or a night on the red carpet (if that ever happened! haha). They just work. So here you go! left to right: Maybelline Define-a-Brow, L'oreal Double Extend Eye Illuminator, Bare Minerals Summer Bisque, IT Cosmetics My Sculpted Face Palette, Mally Beauty Poreless Face Defender. 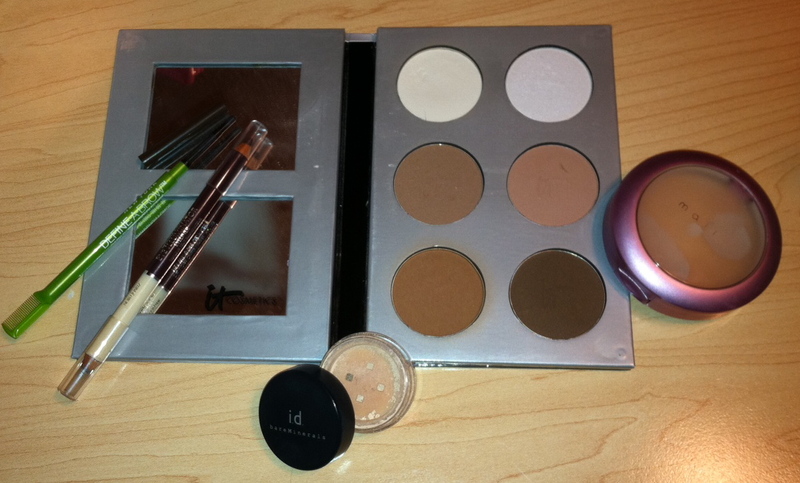 Bare Minerals Summer Bisque... I've talked about this a lot, but it's a highly concentrated mineral powder that can be used alone as a full coverage concealer... my favorite way to use it is to set any cream based under-eye concealer I'm using. It instantly makes the area under my eyes bright and matte, and it doesn't settle into lines or make things look too dry. It comes in a range of shades- mine happens to be Summer Bisque. The coverage is impeccable. The few tiny granules of the product that you see here are all I have left... I'm waiting for the jumbo sized version to arrive from QVC any day now! I have a video on this product, if you'd like to check it out! IT Cosmetics My Sculpted Face Palette... Another QVC find... this is the palette I reach for daily to give my face more shape. It comes with 5 matte colors, including one matte highlight, and then a shimmery highlight. I often use the shade in the lower left hand corner to contour my cheeks, and the shade above that to contour any other areas (nose, forehead, etc.) The matte highlight is genius. It gives great dimension and contrast to the contours, without adding lots of shine. Great for times when I'm on air, but even when I'm not... I just don't feel right not using this! I have a video on this, too. L'oreal Double Extend Eye Illuminator... I have this double-ended pencil in a deep purple/cream shade. I pretty much only use it for the cream-colored end to line my lower inner rim when I want to look more awake. When your wake up call comes at 1:30 in the morning, you have to resort to tricks like this. I used to use a brighter white pencil from Rimmel to do this job, but for the past couple of months, I've been using this pencil... the cream color is less stark, but REALLY opens up the eye. I also don't have any irritation in my waterline when I use it and the texture is just really creamy. I'll sometimes use the plum, but frankly, I think this pencil is worth it just for the light-colored end. 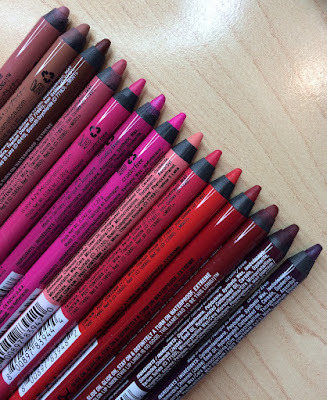 You don't see many (if any) liners that color in the drugstore. Maybelline Define-a-Brow (dark brown)... You can't really tell by the picture, but this is a super duper fine pencil. It's just the right color for my brows, and while I don't require a ton of product on my brows (they're kind of full as-is), I still want whatever I use to look totally natural. I add some definition with this, and cover a small scar. I have no issues with the staying power, it doesn't feel greasy, and it has a little comb at one end that I'll sometimes use. I also usually finish my brow filling with a clear brow gel to keep things in place. Mally Poreless Face Defender... This is a one of a kind product in my makeup collection! It's the last thing that touches my face before I go on the air in the mornings, and it's also my touch-up product. Basically- it's clear and you blot it on with a sponge... the blotting- not swiping- is key. If you're starting to get oily- this seems to eliminate the oil- leaving a satin finish to the skin. Think of it as an alternative to a pressed powder that can tend to look thick when you keep adding more & more. I describe this more in my Mally Favorites video! Just watched last night's X-Factor... cried more than a few times. Can't believe how emotional some of the contestants' stories are. Thank you SO much for the kind comments, tweets, etc. on my Thanksgiving video! I always expect to take some jabs from at least a few people in my videos, but I'm extra grateful that people have been nice to my family members. And thanks to my family for putting up with my shenanigans! Cupcake is being a food snob. Hey Emily - great post! I also like using a cream colored liner for the inner rim instead of a bright white. Not sure if you've tried it, but I like Laura Geller's brightening I- care pencils. I'm pretty much in love with your family. I have a great relationship with my older sister too. In fact, I am leaving the husband and kiddos at home this weekend, and driving 3 hours to spend the long weekend with her and her kids. Oh my gosh. I just posted a question on your coastal scents eye brightener review asking for a drugstore option for a creamy non-white matte eye pencil (like stila topaz) then read this new post and saw L'oreal Double Extend Eye Illuminator. Is this the answer? Is the cream end matte? Hope so! other than not touching your face what helps with making sure makeup doesnt get on your hands or anything else? It is by far the most shocking product to work well when I was so certain it would just take off my makeup. But wow, does it work amazing. I haven't used a setting powder since receiving that product! Your a very up lifting person!! More ppl should be like that!! Your amazing. Great products! I cried watching X-Factor too...I feel like such a sap! I can't Wait for this years EMILY AWARDS!!! I know mally beauty will be making its debut on em awards! And another "viewers favorites" would be awesome too... Just a thought..... ;) Thanks for everything you do Emily!! Nice list. We all have those must have's for everyday. I'd love to try the double extend eye illuminator. I LOVE my Mally poreless face defender! Its the best product in the world! If you are looking for a blog idea I would love to see your favorite lip balms - with the cold weather coming this would be great! i love this post!! it's very imformative i think i might try the cream liner cuz i usually wear black or brown. So ive been trying to expand my collection a little bit cuz i rlly don't have much and i want a little variety in my products but my mom says im wasting all my money and shud spend it on things i want(i want makeup....) and that i have enough already which i definately dont so what should i do?? i think im going to show her your channel cuz i absolutely love it. also it has inspired me to love makeup even more than i already do. Love this post!! Great inspiration for my own blog when I'm running low on ideas lol. BTW, my cat is being a food snob too! What up with that?